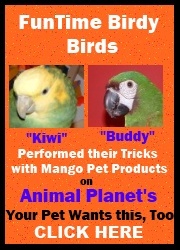 Your birds will love there own special holiday themed Christmas and Chanukah bird toys. I made these toys especially for our birds so that each of our birds can celebrate both holidays. There is one of each toy for every size bird.